Thomas Sackville was by no means a prolific poet. Only four of his poems have survived, and one of those was only very recently discovered. Yet Sackville’s fellows and followers in the art of poetry were in no doubt as to the quality and importance of his work. Edmund Spenser himself, the arch-poet of Elizabethan England, praised Sackville’s ‘‘golden verses.’’ Spenser was particularly impressed by Sackville’s ‘‘induction,’’ one of the two poems he contributed to the second edition of william Baldwin’s compilation A Mirror for Magistrates in 1563. This is the poem that is best known and most appreciated today as a pinnacle of Elizabethan poetry. Royal Ties and Inherited Wealth. Throughout the sixteenth century, England underwent a number of cultural and artistic transformations, often collectively referred to by scholars as the English Renaissance or the golden age in English history. During this time of change, william Shakespeare composed his now famous plays and the Protestant Reformation became the dominant religious trend among the people. 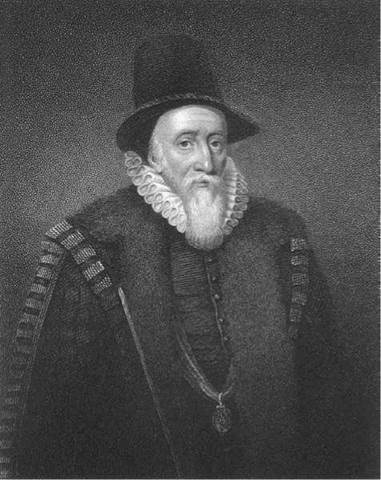 Sackville was born in 1536 in the Sussex village of Buckhurst, from which he took the title Baron Buckhurst when Queen Elizabeth I raised him to the peerage in 1567. Queen Elizabeth I described Sackville as her ‘‘beloved kinsman,’’ for indeed Sackville was related to the queen; her mother, Anne Boleyn, was a cousin of his father, Sir Richard Sackville. It was this royal connection and the wealth that he inherited upon his father’s death in 1566 that confirmed him in his career as a courtier and statesman. In this role, first under Elizabeth and then James I, Sackville was named the first Earl of Dorset in 1605. It was a career for which his birth and breeding had always intended him, but as a young man—indeed, as a boy—he seems to have intended for himself the career of a poet. Oxford Education and the Inns of Court. Very little is known of Sackville’s education, but he attended Oxford before settling, at about age seventeen, in London in 1553. The next year he was married to Cecily, daughter of Sir John Baker, and a year later he was admitted to the Inner Temple, where his father was one of the governors. The Inner Temple was one of the Inns of Court, institutions that functioned both as law colleges and finishing schools for young gentlemen intending the sort of political career that Sackville was eventually to take. The Inns of Court were also the center of literary life in mid-Tudor London. Jasper Heywood, in his translation of Seneca’s Thyestes (1560), includes Sackville among the best of the Inns of Court writers. In Hey- wood’s work “Sackville’s sonnets, sweetly sauced’’ are singled out for praise. These sonnets were probably about love: in “Sackville’s Old Age’’ the poet tells the reader that his ‘‘lusty pen’’ has written many a ‘‘sweet complaint of woeful lover’s wrong.’’ But none of them are now extant, and it is on his ‘‘tragical’’ poetry that Sackville’s reputation now stands. Farewell to Poetry. But Sackville had bade farewell to poetry long before. His last poem, written between 1566 and 1574, is the recently discovered ‘‘Sackville’s Old Age.’’ Here he returns to the theme of the transience of life. He also discusses his reading habits as a younger man (he was still only in his mid-thirties) and lists his favorite English authors: Chaucer, ‘‘my guide, my master’’; Surrey, especially his ‘‘English Virgil’’; and Wyatt’s translations of the Psalms. But, he wrote, it was time to say good-bye to poetry: ‘‘O trifles past, adieu, I ye forsake.’’ He was good to his word, and no other poems of his have been discovered. Characteristically, Sackville died while working at the Council Table in London on April 19, 1608. William Shakespeare (1564-1616): English dramatist and poet who utilized the tragedy drama frequently in his body of work. Miguel de Cervantes (1547-1616): Spanish author whose Don Quixote is often regarded as the first novel. Michel de Montaigne (1533-1592): French author who pioneered the essay as a genre of writing. Elizabeth I (1533-1603): Queen of England and of Ireland from 1558 until her death in 1603. Takeda Shingen (1521-1573): Prominent Japanese feudal lord who sought control over all of Japan during the ''warring states'' period. Andrea Andreani (1540-1623): Italian wood engraver who was among the first to use chiaroscuro, a technique in which light colors are contrasted with darker ones. Although Sackville’s overall literary production is small, since he opted instead for a career in diplomacy and statesmanship, his works are recognized for their historical, if not literary, value. His only play, The Tragedy of Gorboduc (1565), cowritten by Thomas Norton, is considered the first English neoclassical tragedy, and the opening sequence of his poem ‘‘Induction’’ established a humanistic model for a hiemal chronographia, or description of winter, which succeeding generations of writers sought to emulate. Tragedy as Drama. The idea that tragedy was a kind of drama was still a new one in mid-Tudor England. In fact it was Sackville himself, in collaboration with a fellow Inner Templar, Thomas Norton, who wrote the first neoclassical tragic drama in English, The Tragedy of Gorboduc, which was performed at the Inner Temple in 1562. Gorboduc is an important milestone in the history of English ‘‘vernacular humanism,’’ the enrichment of the native literary tradition by incorporating into it material and forms from classical literature, in this case the plays of the Latin tragic dramatist Seneca. The drama as tragedy is an extremely important development in literature, if for no other reason than that it was the preferred form of William Shakespeare. Some of Shakespeare’s most highly acclaimed works—Hamlet, King Lear, Macbeth, and a slew of others—are all considered dramatic tragedies, a form that did not really exist in English literature before Sackville collaborated on The Tragedy of Gorboduc with Thomas Norton. But throughout the sixteenth century the word tragedy was also used in its medieval sense to refer to a short narrative poem dealing with the fall of some great man or woman into misery. This conception of tragedy found its fullest expression in John Lydgate’s translation of Giovanni Boccaccio’s De casibus virorum illustrium as The Fall of Princes (1431-1438). And it was with this kind of tragedy, and indeed this book, that Sackville’s short poetic career began. In the early part of 1555, the printer John Wayland determined to bring out a new edition of Lydgate’s ‘‘Bochas’’ and procured Baldwin and seven others to undertake an appendix dealing with English princes. The book, which appeared in 1559, has a notoriously difficult publishing history, but it seems that the young Sackville—a lad of nineteen years or so at the time—was appointed to write the tragedy of Henry Stafford, Duke of Buckingham, one of the henchmen of Richard III. Baldwin collected nineteen tragedies, and the book went to press, but it was halted in mid-print on orders from the government. Hiemal Chronographia. The ‘‘Induction’’ begins with a traditionally medieval description of a winter landscape, in which the poet Sackville wanders, and where, overtaken by the sudden fall of night, he muses on the mutability of fortune. It was these three stanzas that most haunted the minds of Sackville’s Elizabethan followers. The opening description of a winter landscape, with its ‘‘blustering blasts,’’ ‘‘small fowls flocking,’’ and ‘‘naked twigs ... shivering all for cold,’’ is in itself entirely conventional; every detail can be traced to several earlier poems. But the skill and sensitivity with which these details were knit together made Sackville’s three stanzas the ‘‘classic’’ example of a hiemal chronographia, the one that later poets imitated when they wished to write their own descriptions of winter. Spenser, to take only the most prestigious of Sackville’s imitators, for example, modeled the landscape of his ‘‘January’’ eclogue (1579) on Sackville’s poem. Although critical evaluation of Sackville’s body of work has varied greatly throughout the four and a half centuries since his productive period, it is difficult to challenge the importance of Sackville in the history of English literature. While some modern critics find his verse artificial, his influence on esteemed authors such as Shakespeare and Spenser, in addition to the laudatory comments of his contemporaries, mark it as exceptional. Sackville’s Gorboduc shares much the same fate: admired by his contemporaries for its innovation and appreciated by scholars for the same, it is now rarely considered an outstanding piece of literature outside of these considerations of its revolutionary form. “Induction”. Sackville’s contemporaries enthused about his literary contributions; for instance, Edmund Spenser lauded Sackville’s ‘‘golden verses.’’ However, in light of the small quantity of Sackville’s writings, some twentieth-century critics have questioned the value of his literary achievement. ‘‘Sackville’s reputation owes too much to an interpretative treatment of literary history,’’ wrote J. Stewart. ‘‘Whether such a treatment regards his work as the last flower of medievalism or as a prelude to Spenser, is immaterial.’’ Nonetheless, Sackville’s ‘‘Induction’’ remains most appreciated today as ‘‘one of the first truly great Elizabethan poems,’’ according to Alan T. Bradford. A Doll's House (1879), a play by Henrik Ibsen. In this work, Ibsen explores and, indeed, criticizes the norms of marriage in the nineteenth century. The Tragical History of Doctor Faustus (1604), a play by Christopher Marlowe. In this work, Faust (whose Latin name is Faustus) sells his soul to the devil for knowledge and power. 1. Although Sackville helped pioneer the tragic drama, he did not define its limitations nor even produce the most notable examples of the form. Read Gorboduc and, in a short essay, compare it in style, theme, and content with another popular tragedy—something from Shakespeare or Marlowe’s The Tragical History of Doctor Faustus. Can you find elements of Sackville’s work that seem to have influenced Shakespeare and Marlowe? 2. Thomas Sackville was in his mid-thirties when he considered himself an old man. Indeed, Shakespeare, too, wrote about being an old man when he was also in his thirties. Using the Internet and the library, research life expectancies and living standards during Thomas Sackville’s lifetime. Then, in a short essay or story, explore the following question: What role does an author’s life expectancy play in shaping his or her work? How would your life be different if you viewed your thirties as ‘‘old age’’? Would your plans for the next ten years change? If so, how? 3. The hiemal chronographia—the description of winter—at the beginning of Sackville’s ‘‘Induction’’ inspired a number of poets after Sackville. Read “Induction.’’ One of the marks of effective poetry is that it enables you to see clearly what is being described. Do the opening lines of ‘‘Induction’’ qualify? Try it out. When you read these lines, what do you picture? Now, make a drawing, painting, or sculpture of what you see when you read these lines. Then, in a short essay, reflect on the connection between the written words and what you’ve produced—think about which descriptions inspired which images. 4. Critics have argued that as Sackville’s career advanced, his work decreased in literary merit. Read Gorboduc, ‘‘Induction,’’ and ‘‘Complaint,’’ then respond to this criticism of Sackville’s work. Do you agree or disagree? In your response, cite examples from the texts to support your argument. Baker, Howard. Induction to Tragedy, a Study in the Development of Form in Gorboduc, The Spanish Tragedy, and Titus Andronicus. Baton Rouge: Louisiana State University Press, 1939. Berlin, Normand. Thomas Sackville. Boston: Twayne, 1974. Clemen, Wolfgang. English Tragedy before Shakespeare. London: Methuen, 1961. Doran, Madeleine. Endeavors of Art: A Study of Form in Elizabethan Drama. Reading, Mass. : Addison-Wesley, 1994. Herrick, M. T. Studies in Speech and Drama in Honor of Alexander M. Drummond. Ithaca, N.Y.: Cornell University Press, 1944. Lewis, C. S. English Literature in the Sixteenth Century, Excluding Drama. Oxford University Press, 1954. Ribner, Irving. The English History Play in the Age of Shakespeare. London: Methuen, 1965. Talbert, Ernest W. Studies in Honor of Dewitt T. Starnes. Austin: University of Texas Humanities Research Center, 1967.